The Proto-Indo-European homeland according to the steppe hypothesis (dark green) and the present-day distribution of Indo-European languages in Eurasia (light green). The Proto-Indo-European homeland (or Indo-European homeland) was the prehistoric urheimat of the Indo-European languages – the region where their reconstructed common ancestor, the Proto-Indo-European language (PIE), was originally spoken. From this region, its speakers migrated east and west, and went on to form the proto-communities of the different branches of the language family. The most widely accepted proposal to identify the Proto-Indo-European homeland is the steppe hypothesis, which puts the PIE homeland in the Pontic–Caspian steppe around 4000 BC. A minority support the Anatolian hypothesis, which puts it in Anatolia around 8000 BC. A notable, though unlikely, third possibility is the Armenian hypothesis which situates the homeland south of the Caucasus. Several other explanations have been proposed, including the Neolithic creolisation hypothesis, Paleolithic Continuity Theory, and Indigenous Aryans or "Out of India" theory. These are not widely accepted, or are considered to be fringe theories. The search for the homeland of the Indo-Europeans began in the late 18th century with the discovery of the Indo-European language family. The methods used to establish the homeland have been drawn from the disciplines of historical linguistics, archaeology, physical anthropology and, more recently, human population genetics. 1.1 "The two leading competitors"
The Steppe theory and the Anatolian hypothesis are "the two leading competitors" for the Indo-European homeland. The steppe hypothesis places the PIE homeland in the Pontic steppe around 4000 BC. The majority of Indo-European specialists support the steppe hypothesis, though critical issues[example needed] remain to be clarified. The Anatolian hypothesis places the pre-PIE homeland in Anatolia around 8000 BC, and the homeland of Proto-Indo-European proper in the Balkans around 5000 BC. Although it has attracted substantive attention and discussions, the datings it proposes are at odds with the linguistic timeframe for Proto-Indo-European and with genetic data which do not find evidence for Anatolian origins in the Indian genepool. A notable, though unlikely, third possibility is the "Near Eastern model", also known as the Armenian hypothesis. It was proposed by Gamkrelidze and Ivanov, postulating connections between Indo-European and Caucasian languages based on the disputed glottalic theory and connected to archaeological findings by Grogoriev. Traditionally homelands of linguistic families are proposed based on evidence from comparative linguistics coupled with evidence of historical populations and migrations from archaeology. Today, genetics via DNA samples is increasingly used in the study of ancient population movements. Proto-Uralic and PIE share a core vocabulary, such as words for "name" and "water", and similar-looking pronouns. This may be due to a common ancestor, or to intensive borrowing, but both options suggest that their homelands were located near each other. PIE also borrowed words from Caucasian languages, especially Kartvelian, which suggests a location close to the Caucasus. Late PIE for "the common ancestor of all other IE branches". The Anatolian languages are the first Indo-European language family to have split off from the main group. Due to the archaic elements preserved in the Anatolian languages, they may be a "cousin" of Proto-Indo-European, instead of a "daughter", but Anatolian is generally regarded as an early offshoot of the Indo-European language group. The Indo-Hittite hypothesis postulates a common predecessor for both the Anatolian languages and the other indo-European languages, called Indi-Hittite or Indo-Anatolian. Although PIE had predecessors, the Indo-Hittite hypothesis is not widely accepted, and there is little to suggest that it is possible to reconstruct a proto-Indo-Hittite stage that differs substantially from what is already reconstructed for PIE. In the early 1980s, a mainstream consensus had emerged among Indo-Europeanists in favour of the "Kurgan hypothesis" (named after the kurgans, burial mounds, of the Eurasian steppes) placing the Indo-European homeland in the Pontic–Caspian steppe of the Chalcolithic. This was not least due to the influence of the Journal of Indo-European Studies, edited by J. P. Mallory, that focused on the ideas of Marija Gimbutas and offered some improvements. Gimbutas had created a modern variation on the traditional invasion theory in which the Indo-Europeans were a nomadic tribe in Eastern Ukraine and Southern Russia and expanded on horseback in several waves during the 3rd millennium BC. Their expansion coincided with the taming of the horse. Leaving archaeological signs of their presence (see Corded Ware culture), they subjugated the peaceful European Neolithic farmers of Gimbutas' Old Europe. As Gimbutas' beliefs evolved, she put increasing emphasis on the patriarchal, patrilineal nature of the invading culture, sharply contrasting it with the supposedly egalitarian, if not matrilineal culture of the invaded, to the point of formulating essentially a feminist archaeology. Her interpretation of Indo-European culture found genetic support in remains from the Neolithic culture of Scandinavia, where DNA from bone remains in Neolithic graves indicated that the megalith culture was either matrilocal or matrilineal, as the people buried in the same grave were related through the women. Likewise, there is a tradition of remaining matrilineal traditions among the Picts. The Gimbutas-Mallory Kurgan hypothesis seeks to identify the source of the Indo-European language expansion as a succession of migrations from the Pontic–Caspian steppe, originating in the area encompassed by the Sredny Stog culture (c. 4500 BC). J. P. Mallory, dating the migrations later, to c. 4000 BC, and putting less insistence on their violent or quasi-military nature, essentially modified Gimbutas' theory making it compatible with a less gender-political narrative. David Anthony, focusing mostly on the evidence for the domestication of horses and the presence of wheeled vehicles, came to regard specifically the Yamna culture, which replaced the Sredny Stog culture around 3500 BC, as the most likely candidate for the Proto-Indo-European speech community. Anthony describes the spread of cattle-raising from early farmers in the Danube Valley into the Ukrainian steppes in the 6th–5th millennium BC, forming a cultural border with the hunter-gatherers whose languages may have included archaic PIE. Anthony notes that domesticated cattle and sheep probably didn't enter the steppes from the Transcaucasia, since the early farming communities there were not widespread, and separated from the steppes by the glaciated Caucasus. Subsequent cultures developed in this area which adopted cattle, most notably the Cucuteni-Trypillian culture. Parpola regards the Tripolye culture as the birthplace of wheeled vehicles, and therefore as the homeland for Late PIE, assuming that Early PIE was spoken by Skelya pastoralists (early Sredny Stog culture) who took over the Tripolye culture at c. 4300–4000 BC. On its eastern border lay the Sredny Stog culture (4400–3400 BC), whose origins are related to "people from the east, perhaps from the Volga steppes". It plays a central role in Gimbutas' Kurgan hypothesis, and coincides with the spread of early PIE across the steppes and into the Danube valley (c. 4000 BC), leading to the collapse of Old Europe. Hereafter the Maykop culture suddenly arose, Tripolye towns grew strongly, and eastern steppe people migrated to the Altai mountains, founding the Afanasevo culture (3300 to 2500 BC). The core element of the steppe hypothesis is the identification of the proto-Indo-European culture as a nomadic pastoralist society that did not practice intensive agriculture. This identification rests on the fact that vocabulary related to cows, to horses and horsemanship, and to wheeled vehicles can be reconstructed for all branches of the family, whereas only a few agricultural vocabulary items are reconstructable, suggesting a gradual adoption of agriculture through contact with non-Indo-Europeans. If this evidence and reasoning is accepted, the search for the Indo-European proto-culture has to involve searching for the earliest introduction of domesticated horses and wagons into Europe. Responding to these arguments, proponents of the Anatolian hypothesis Russell Gray and Quentin Atkinson have argued that the different branches could have independently developed similar vocabulary based on the same roots, creating the false appearance of shared inheritance – or alternatively, that the words related to wheeled vehicle might have been borrowed across Europe at a later date. Proponents of the Steppe hypothesis have argued this to be highly unlikely, and to break with the established principles for reasonable assumptions when explaining linguistic comparative data. Another source of evidence for the steppe hypothesis is the presence of what appears to be many shared loanwords between Uralic languages and proto-Indo-European, suggesting that these languages were spoken in adjacent areas. This would have had to take place a good deal further north than the Anatolian or Near Eastern scenarios would allow. According to Kortlandt, Indo-Uralic is the pre-PIE, postulating that Indo-European and Uralic share a common ancestor. According to Kortlandt, "Indo-European is a branch of Indo-Uralic which was radically transformed under the influence of a North Caucasian substratum when its speakers moved from the area north of the Caspian Sea to the area north of the Black Sea. "[note 2][note 3] Anthony notes that the validity of such deep relationships cannot be reliably demonstrated due to the time-depth involved, and also notes that the similarities may be explained by borrowings from PIE into proto-Uralic. Yet, Anthony also notes that the North Caucasian communities "were southern participants in the steppe world". Three genetic studies in 2015 gave support to the Kurgan theory of Gimbutas regarding the Indo-European Urheimat. According to those studies, haplogroups R1b and R1a, now the most common in Europe (R1a is also common in South Asia) would have expanded from the Russian steppes, along with the Indo European languages; they also detected an autosomal component present in modern Europeans which was not present in Neolithic Europeans, which would have been introduced with paternal lineages R1b and R1a, as well as Indo European Languages. Many geneticists consider Haplogroup R1a to be associated with the origins and spread of the Indo-Europeans. R1a1 shows a strong correlation with the distribution of the Indo-European languages in Europe and south Asia, being most prevalent in Poland, Russia, and Ukraine, and in central Asia, Afghanistan, Pakistan and India. Two specific subclades dominate, namely R1-Z282 in Eastern-Europe and R1-Z93 in South Asia and South-Siberia. According to Underhill et al. (2014), the initial diversification of R1a took place in the vicinity of Iran, while Pamjav et al. (2012) think that R1a diversified within the Eurasian Steppes or the Middle East and Caucasus region. In 2015, a large-scale ancient DNA study published in Nature found evidence of a "massive migration" from the Pontic-Caspian steppe to Central Europe that took place about 4,500 years ago. It found that individuals from the Central European Corded Ware culture (3rd millennium BC) were genetically closely related to individuals from the Yamnaya culture. The authors concluded that their "results provide support for the theory of a steppe origin of at least some of the Indo-European languages of Europe." However, archaeologists have argued that although such a migration might have taken place, it does not necessarily explain either the distribution of archaeological cultures or the spread of the Indo-European languages. The main competitor to the Kurgan hypothesis is the Anatolian hypothesis advanced by Colin Renfrew in 1987. It couples the spread of the Indo-European languages to the hard fact of the neolithic spread of farming from the Near East, stating that the Indo-European languages began to spread peacefully into Europe from Asia Minor from around 7000 BC with the Neolithic advance of farming (wave of advance). The expansion of agriculture from the Middle East would have diffused three language families: Indo-European toward Europe, Dravidian toward Pakistan and India, and Afro-Asiatic toward Arabia and North Africa. Reacting to criticism, Renfrew revised his proposal to the effect of taking a pronounced Indo-Hittite position. Renfrew's revised views place only Pre-Proto-Indo-European in 7th millennium BC Anatolia, proposing as the homeland of Proto-Indo-European proper the Balkans around 5000 BC, explicitly identified as the "Old European culture" proposed by Marija Gimbutas. He thus still situates the original source of the Indo-European language family in Anatolia c. 7000 BC. Reconstructions of a Bronze Age PIE society based on vocabulary items like "wheel" do not necessarily hold for the Anatolian branch, which appears to have separated from PIE at an early stage, prior to the invention of wheeled vehicles. The main objection to this theory is that it requires an unrealistically early date. According to linguistic analysis, the Proto-Indo-European lexicon seems to include words for a range of inventions and practices related to the Secondary Products Revolution, which post-dates the early spread of farming. On lexico-cultural dating, Proto-Indo-European cannot be earlier than 4000 BC. The idea that farming was spread from Anatolia in a single wave has been revised. Instead it appears to have spread in several waves by several routes, primarily from the Levant. The trail of plant domesticates indicates an initial foray from the Levant by sea. The overland route via Anatolia seems to have been most significant in spreading farming into south-east Europe. Farming developed independently in the eastern fertile crescent. Non-Indo-European languages appear to be associated with the spread of farming from the Near East into North Africa and the Caucasus. According to Lazaridis et al. (2016), farming developed independently both in the Levant and in the eastern Fertile Crescent. After this initial development, the two regions and the Caucasus interacted, and the chalcolithic north-west Iranian population appears to be a mixture of Iranian neolithic, Levant, and Caucasus hunter-gatherers. According to Lazaridis et al. (2016), "farmers related to those from Iran spread northward into the Eurasian steppe; and people related to both the early farmers of Iran and to the pastoralists of the Eurasian steppe spread eastward into South Asia". They further note that ANI "can be modelled as a mix of ancestry related to both early farmers of western Iran and to people of the Bronze Age Eurasian steppe", which makes it unlikely that the Indo-European languages in India are derived from Anatolia. Mascarenhas et al. (2015) note that the expansion of Z93 from Transcaucasia into South Asia is compatible with "the archeological records of eastward expansion of West Asian populations in the 4th millennium BC culminating in the socalled Kura-Araxes migrations in the post-Uruk IV period". ...if the expansions began at 9,500 years ago from Anatolia and at 6,000 years ago from the Yamnaya culture region, then a 3,500-year period elapsed during their migration to the Volga-Don region from Anatolia, probably through the Balkans. There a completely new, mostly pastoral culture developed under the stimulus of an environment unfavorable to standard agriculture, but offering new attractive possibilities. Our hypothesis is, therefore, that Indo-European languages derived from a secondary expansion from the Yamnaya culture region after the Neolithic farmers, possibly coming from Anatolia and settled there, developing pastoral nomadism. 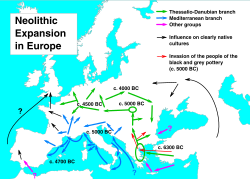 ... while we see substantial genetic and archaeological evidence for an Indo-European migration originating in the southern Russian steppes, there is little evidence for a similarly massive Indo-European migration from the Middle East to Europe. One possibility is that, as a much earlier migration (8,000 years old, as opposed to 4,000), the genetic signals carried by Indo-European-speaking farmers may simply have dispersed over the years. There is clearly some genetic evidence for migration from the Middle East, as Cavalli-Sforza and his colleagues showed, but the signal is not strong enough for us to trace the distribution of Neolithic languages throughout the entirety of Indo-European-speaking Europe. Gamkrelidze and Ivanov proposed that the Greeks moved west across Anatolia to their present location, a northward movement of some IE speakers that brought them into contact with the Finno-Ugric languages, and suggested that the Kurgan area, or better "Black Sea and Volga steppe," was a secondary homeland from which the western IE languages emerged. A 2015 genetic study by Haak et al. (2015) argues that their findings of gene flow of a population that shares traits with modern-day Armenians into the Yamnaya pastoralist culture lends support to the Armenian hypothesis,[note 5] while Lazaridis et al. (2016) state that "farmers related to those from Iran spread northward into the Eurasian steppe." According to David Reich, "the most likely location of the population that first spoke an Indo-European language was south of the Caucasus Mountains, perhaps in present-day Iran or Armenia, because ancient DNA from people who lived there matches what we would expect for a source population both for the Yamnaya and for ancient Anatolians". Lothar Kilian and Marek Zvelebil have proposed a 6th millennium BC or later origin in Northern Europe. The Steppe theory is compatible with the argument that the PIE homeland must have been larger, because the "Neolithic creolisation hypothesis" allows the Pontic-Caspian region to have been part of PIE territory. Since 2004, an informal workgroup of scholars who support the Paleolithic Continuity hypothesis has been held online. Apart from Alinei himself, its leading members (referred to as "Scientific Committee" in the website) are linguists Xaverio Ballester (University of Valencia) and Francesco Benozzo (University of Bologna). Also included are prehistorian Marcel Otte (Université de Liège) and anthropologist Henry Harpending (University of Utah). The Indigenous Aryans theory, also known as the Out of India theory, proposes an Indian origin for the Indo-European languages. The languages of northern India and Pakistan, including Hindi and the historically and culturally significant liturgical language Sanskrit, belong to the Indo-Aryan branch of the Indo-European language family. The Steppe model, rhetorically presented as an "Aryan invasion", has been opposed by Hindu revivalists and Hindu nationalists, who argue that the Aryans were indigenous to India, and some, such as B.B. Lal, Koenraad Elst and Shrikant Talageri, have proposed that Proto-Indo-European itself originated in northern India, either with or shortly before the Indus Valley Civilisation. This "Out of India" theory is not regarded as plausible in mainstream scholarship. ^ Anthony notes that those Semitic borrowings may also have occurred through the advancement of Anatolian farmer cultures via the Danube valley into the steppe zone. ^ Kortlandt (2010) refers to Kortlandt, Frederik. 2007b. C.C. Uhlenbeck on Indo-European, Uralic and Caucasian. ^ The "Sogdiana hypothesis" of Johanna Nichols places the homeland in the 4th or 5th millennium BC to the east of the Caspian Sea, in the area of ancient Bactria-Sogdiana. According to Bernard Sergent the lithic assemblage of the first Kurgan culture in Ukraine (Sredni Stog II), which originated from the Volga and South Urals, recalls that of the Mesolithic-Neolithic sites to the east of the Caspian sea, Dam Dam Chesme II and the cave of Djebel. He places the roots of the Gimbutas' Kurgan cradle of Indo-Europeans in a more southern cradle, and adds that the Djebel material is related to a Paleolithic material of Northwestern Iran, the Zarzian culture, dated 10000–8500 BC, and in the more ancient Kebarian of the Near East. He concludes that more than 10,000 years ago the Indo-Europeans were a small people grammatically, phonetically and lexically close to Semitic-Hamitic populations of the Near East. ^ Lazaridis et al. (2016): "The spread of Near Eastern ancestry into the Eurasian steppe was previously inferred without access to ancient samples, by hypothesizing a population related to present-day Armenians as a source." Lazaridis et al. (2016) refer to Haak et al. (2015). ^ Haak et al. (2015): "The Armenian plateau hypothesis gains in plausibility by the fact that we have discovered evidence of admixture in the ancestry of Yamnaya steppe pastoralists, including gene flow from a population of Near Eastern ancestry for which Armenians today appear to be a reasonable surrogate (SI4, SI7, SI9). However, the question of what languages were spoken by the 'Eastern European hunter-gatherers' and the southern, Armenian-like, ancestral population remains open." ^ Mario Alinei: "The sharp, and now at last admitted even by traditionalists (Villar 1991) [Villar, Francisco (1991), Los indoeuropeos y los orígines de Europa. Lenguaje y historia, Madrid, Gredos] differentiation of farming terminology in the different IE languages, while absolutely unexplainable in the context of Renfrew's NDT, provides yet another fundamental proof that the differentiation of IE languages goes back to remote prehistory." ^ a b c d e f g h i j k l m n o p q r s t u v w x y z Anthony 2007. ^ a b c d e f g Anthony & Ringe 2015. ^ a b Haak et al. 2015. ^ Renfrew, Colin (1990). Archaeology and Language: The Puzzle of Indo-European Origins. CUP Archive. ISBN 9780521386753. ^ a b Gray & Atkinson 2003. ^ Pereltsvaig & Lewis 2015, pp. 19–38. ^ a b c d Mallory 2013. ^ a b c d e f Lazaridis 2016. ^ a b Zvelebil 1995. ^ a b c Watkins 2000. ^ Mallory 1996, p. 347. ^ a b Mallory & Adams 2006, p. 249. ^ Parpola 2015, p. 49. ^ a b Lazaridis 2016, p. 8. ^ a b c Panjav 2012. ^ a b c Underhill 2015. ^ Vander Linden, Marc (2016-08-03). "Population history in third-millennium-BC Europe: assessing the contribution of genetics". World Archaeology. 48 (5): 714–728. doi:10.1080/00438243.2016.1209124. ^ Renfrew, Colin (2003). "Time Depth, Convergence Theory, and Innovation in Proto-Indo-European: 'Old Europe' as a PIE Linguistic Area". In Bammesberger, Alfred; Vennemann, Theo. Languages in Prehistoric Europe. Heidelberg: Universitätsverlag Winter GmBH. pp. 17–48. ISBN 978-3-82-531449-1. ^ Mallory & Adams 2006, pp. 101–102. ^ R. Pinhasi, J. Fort and A. J. Ammerman, Tracing the origin and spread of agriculture in Europe, PLoS Biology, 3, no. 12 (2005), e436. ^ F. Coward et al., The spread of Neolithic plant economies from the Near East to Northwest Europe: a phylogenetic analysis, Journal of Archaeological Science, vol. 35, no. 1 (2008), pp. 42–56. ^ M. Özdogan, Archaeological evidence on the westward expansion of farming communities from eastern Anatolia to the Aegean and the Balkans, Current Anthropology, vol. 52, no. S4 (2011), S415-S430. ^ a b Lazaridis et al. 2016. ^ a b Haak et al. 2015, p. 137. ^ Mallory 1997, p. 106. ^ "Indo-Aryan languages". Retrieved 2016-07-06. ^ Talageri, Shrikant G. (2000). The Rigveda: a historical analysis. New Delhi: Aditya Prakashan. ISBN 978-81-7742-010-4. Atkinson, Quentin; Nicholls, Geoff; Welch, David; Gray, Russell (2005). "From words to dates: water into wine, mathemagic or phylogenetic inference?". Transactions of the Philological Society. 103 (2): 193–219. doi:10.1111/j.1467-968x.2005.00151.x. Bouckaert, Remco; Lemey, Philippe; Dunn, Michael; Greenhill, Simon J.; Alekseyenko, Alexander V.; Drummond, Alexei J.; Gray, Russell D.; Suchard, Marc A.; Atkinson, Quentin D. (2012). "Mapping the Origins and Expansion of the Indo-European Language Family". Science. 337 (6097): 957–960. Bibcode:2012Sci...337..957B. doi:10.1126/science.1219669. PMC 4112997. PMID 22923579. Cavalli-Sforza, Luigi Luca (2000). Genes, peoples, and languages. Farrar Straus & Giroux. ISBN 978-0-86547-529-8. Piazza, Alberto; Cavalli-Sforza, Luigi (2006). "Diffusion of genes and languages in human evolution". Proceedings of the 6th International Conference on the Evolution of Language. pp. 255–266. Renfrew, Colin (1990). Archaeology and Language: The Puzzle of Indo-European Origins. CUP Archive. ISBN 9780521386753. Calvert Watkins. "Indo-European and the Indo-Europeans. The American Heritage Dictionary of the English Language, Fourth Edition. 2000". Archived from the original on 1 March 2009. Retrieved 25 April 2013.